Which public artworks will you find this Canada Day? Public art defines a city — especially a capital. Public art is meant to inspire and move us. Think of the National War Memorial on Elgin Street. It invites us to mourn and thank our fallen soldiers. Public art can entertain. Tim DesClouds’ numerous whirligig sculptures make our day a little more joyful. Clever graffiti art plays a similar role. Public art can shape attitudes. Aboriginal artist Jeff Thomas has reminded us through his own art that century-old sculptures of kneeling, subservient “braves” reinforce stereotypes. Look closely. They are scattered across the city. Here we present seven examples of public art in Ottawa. Behind Bruce Garner’s Dagain, there is a love story. A different kind of love prompted Mackenzie King to erect a statue of Sir Galahad. There is a story behind every piece of art. But art is subjective. Feel free to create your own narrative. 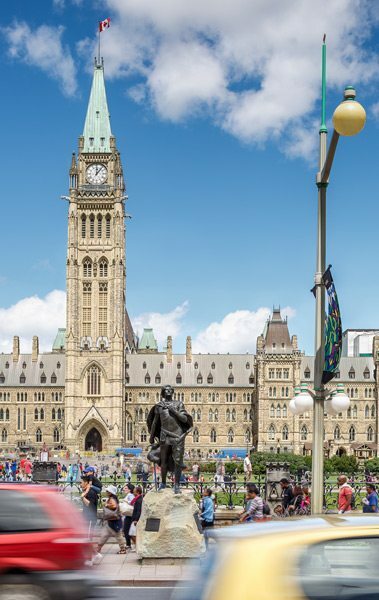 The statue of Sir Galahad on Wellington Street in front of Parliament Hill was commissioned by Mackenzie King to honour his bosom buddy Henry Albert Harper, who died December 6, 1901 trying to rescue a woman who fell through the ice during a vice-regal skating party on the Ottawa River. It’s a weathervane. It’s a flying cow on wheels. It’s called When the Cows Come Home. It’s appropriately placed in front of the Cattle Castle, a.k.a. 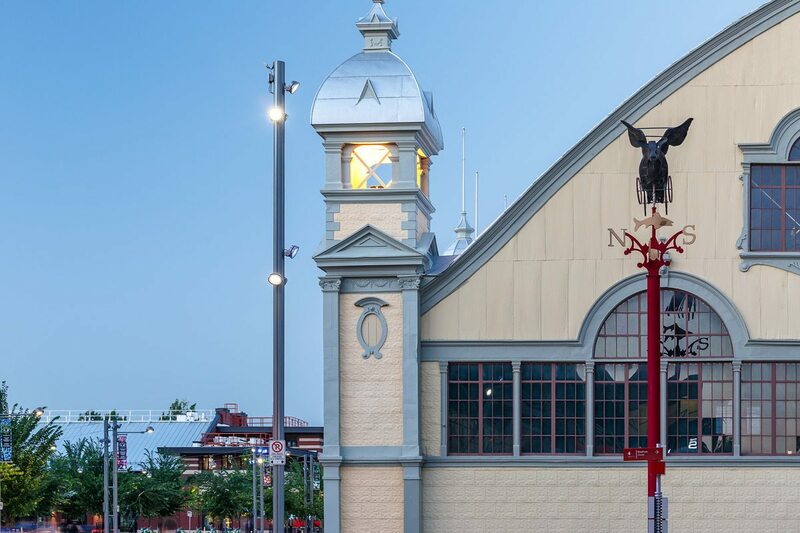 Aberdeen Pavilion in Lansdowne Park. Ottawa can thank Tim DesClouds. 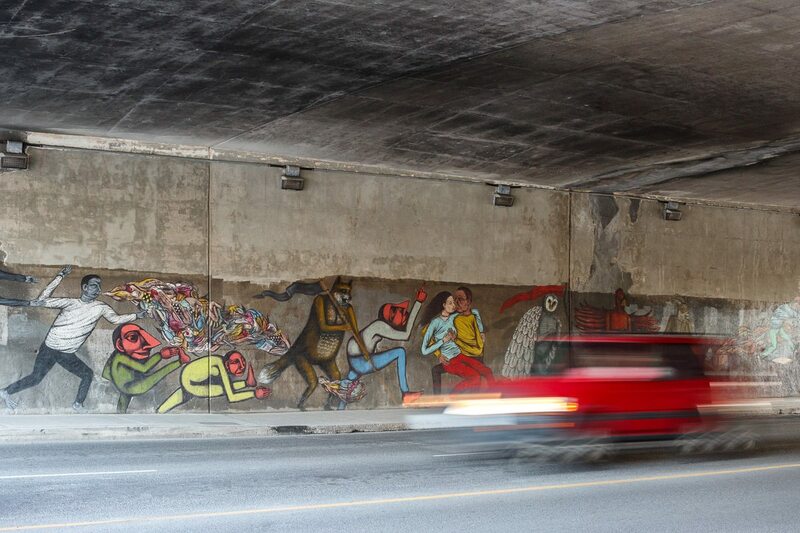 Visit Bank street under the Queensway to discover, on a cement wall, a parade of eccentric people and anthropomorphic animals hurrying northward. The city-commissioned mural, Heart of a City in Motion, was painted by Drew Mosley, Felix Berube, and Troy Lovegates. The living room, an installation by Urban Keios, sits outside City Hall. Passersby inevitably are drawn to sit on one of the chairs and watch the world through a window masquerading as a screenless television. 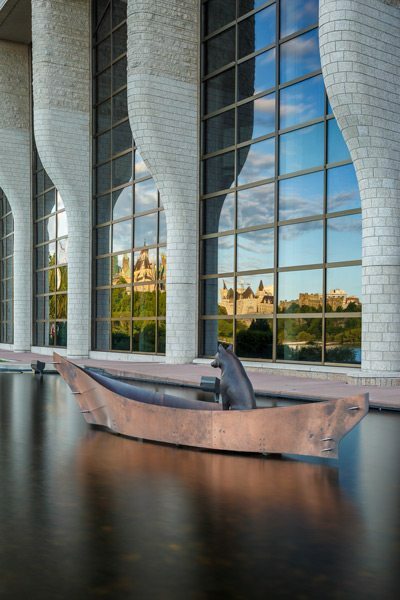 This life-sized bronze wolf sits in a copper canoe in an outdoor pool next to the Canadian Museum of History. Created by Aboriginal artist Mary Anne Barkhouse, the sculpture — titled ’namaxsala‘, which means “to travel in a boat together” in Kwakwala — reflects the need for humans to respect all inhabitants of planet Earth.